Committee chair Matthew Mitchell discusses Evanston’s current police complaint process. The Citizen Police Complaint Assessment Committee will report its recommendations in May. 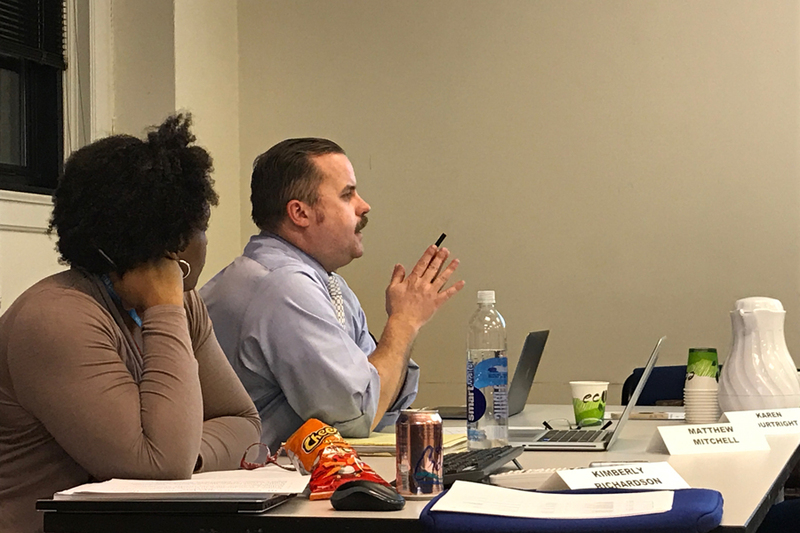 The Citizen Police Complaint Assessment Committee addressed the weaknesses of Evanston’s current complaint process at a Wednesday meeting. In the penultimate meeting before members must create a report of their findings to present to the Human Services Committee in May, the committee honed in on changes that could realistically be implemented in the complaint process. The Evanston Police Department currently utilizes a review process. Once a complaint is filed, the Office of Professional Standards begins an investigation by speaking with the individual and compiling evidence. The complaint is then reviewed at Citizens’ Police Advisory Committee and Human Services Committee meetings. Committee member Jared Davis said he is concerned about how complainants perceive the process, since the Citizens’ Police Advisory Committee lacks the power to overturn a complaint. EPD Sgt. Dennis Leaks said if the majority of the advisory committee disagrees with a complaint, it will be taken back to the chief of police for review. However, he added that this has not happened in any of the 27 complaints filed over the last two years. Committee chair Matthew Mitchell said he and other members plan to attend the Citizens’ Police Advisory Committee meeting next Wednesday, where the committee will review four police complaints. This is the first time the Citizens’ Police Advisory Committee will review a complaint since the Citizen Police Complaint Assessment Committee assembled last October. Another flaw in the process is the lack of support for complainants, committee member Karen Courtright said. To address this, the committee has been researching ways to use mediation as a supplement to the process, Mitchell said. Mitchell is involved in the Alternative Dispute Resolution community — a practice of law that uses mediation — and he used to work as a mediator. He said the practice was common, but “not very highly utilized.” Mitchell added that in New York City, only two of the thousands of complaints filed in 2017 were mediated. “You can create the best system, but if it doesn’t work in practice, it’s obsolete,” Mitchell said. The committee emphasized the importance of their recommendations actually being implemented. In order to assure their work is recognized, committee members agreed to present incremental changes, such as changes to the complaint form, before introducing a new process.